This wasn't some Hollywood movie, but life. The stakes were high. Operation Argo has turned in a very popular subject between the espionage and conspiracies fans, such as Simplyreaders, of course. After all, what can be better than a real case published in a diary/novel/chronicle format? Antonio Méndez sets us in the middle of the Cold War era describing the landscape and political pieces on the board and we can easily feel the thick air and tensions between the power domes on every extreme of the world. At the time, Iran was a chaotic mess. The USA embassy in Iran has been taken by the revolution army in Tehran and hosted American citizens. The 6 lucky ones who managed to escape from it are hidden by the Canadians in the Embassy and later in a safety house. The northern neighbors of USA took the risk of a diplomatic conflict and actively participated in the operation giving full cooperation and cover to the CIA that, led by Antonio Mendez, has prepared one of the craziest deceptions ever. Many ideas arouse to rescue the hostages, from schoolteachers and agriculture experts to a full military operation that ended in a big fiasco. 'Argo' is the only one alternative and will put together all kind of resources in order to succeed: governments, CIA and Hollywood. There is a great tradition in espionage operations of using the principles of magic, misdirection, illusion, deception, and denial. Keep an eye on: how the operation was prepared, the doubts, the little details that must be cared as a part of a perfect plan that explores the mind of the enemy a 100 steps forward to avoid any single tiny doubt, the psychological preparation of the agents and the hostages. The description of all the tension and political interests involved in the situation. Be prepared. It was not just a Baden-Powell Boy Scouts motto. 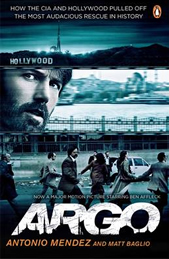 'Argo' is nothing else but an excellent first hand version of real events that will fascinate every big fan of espionage and deception operations. Any reader who considers itself a spy literature connoisseur must have this book in its shelf. The first rule in any deception operation is to understand who your audience is.